Are you looking to get a new vehicle and want something that has a little more space than the average sedan? But, do you not want to have to pay more in fuel costs for a large and bulky SUV? Then perhaps you should consider the subcompact crossover SUV market! These smaller SUVs are perfect for those looking to get more space without sacrificing efficiency! More and more drivers are switching to efficient SUVs, and manufacturers are responding by pumping out more models and options than ever! But, one model that has stood out has been the Toyota C-HR. 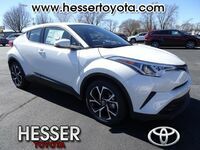 Now, the newest edition of the popular Toyota crossover, the 2019 Toyota C-HR, is finally here and available at Hesser Toyota! We'll break down everything you need to know about the 2019 Toyota C-HR from its engine specs to its safety features, right here in our model research page! Let’s get started! Let's begin by taking a look underneath the hood! 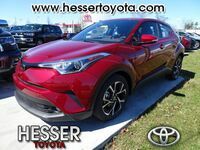 The 2019 Toyota C-HR comes standard with a punchy and efficient 2.0-liter 4-cylinder engine that offers solid performance, delivering 144 horsepower and 139 lb-ft of torque. Plus, it also offers great efficiency, getting up to an EPA-estimated 31 highway mpg. This engine is paired with the Continuously Variable Transmission with intelligent and Shift Mode (CVTi-S) for a smooth and efficient drive! The C-HR is known for having one of the most striking designs in Toyota’s lineup, and that doesn’t change with the 2019 C-HR! The diamond-like styling will turn heads everywhere, and the new standard cantilevered rear spoiler and cluster LED DRL with halogen headlights add a sporty but refined look to the already unique Toyota C-HR look. Once inside the 2019 Toyota C-HR, drivers will find the advanced technology that many have come to expect from the newest Toyota models. The standard 8-in. Audio display offers allow drivers to easily navigate their entertainment and information with the touchscreen, including accessing the app suite and Apple CarPlay! Plus, the new standard Electric Parking Brake makes parking just the push of a button and includes the Brake Hold feature! Want to learn more about the 2019 Toyota C-HR? Ready to get behind the wheel of one? Contact our staff at Hesser Toyota for more information or to schedule a test drive today!